Windows 10 is here! Download and install the latest OS from Microsoft and get the sleek computing experience. Microsoft has provided a platform for the smooth installation and upgrade for Windows 7/8.1 users with the MediaTool utility, however, users with limited/unsteady or slow/poor internet connection finds it difficult to use this tool. 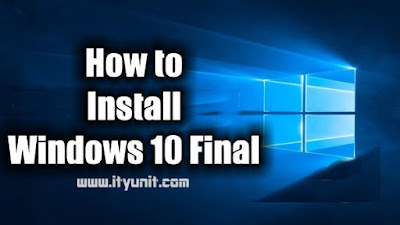 Therefore, this article will provide a smooth process for the download, installation or upgrade of your OS to Windows 10 without any fear of unfinished installation due to disconnection or when mediatool is not downloading. Most often, we see “How to install Windows 10 from USB” but here, I will show you a simple method of installing Windows 10 on Windows 7 from a virtual drive by simply mounting the downloaded iso file on it instead of to create a bootable DVD or USB. In spite of the minimum requirements for the upgrade to Windows 10 (Click here to see the min. specs), it is highly recommended to have at least 2 GB RAM and 50 GB disk capacity to allow for your backup files from the previous Windows installation. 2. Download latest final release of Windows 10 Enterprise iso file from getintopc.com (3 GB) or the All-in-one Windows 10 Pack (4.5 GB) in case you need the Pro Version. Wait for full download. Remember that with this option of downloading the iso file, you can use IDM to accelerate the download (an option MediaTool doesn’t have). 3. Click to run the Magicdisc, and then go to your notification area of the taskbar and right-click on the Magicdisc icon to bring up the options. 4. Choose the first option, “Virtual CD/DVD ROM” and follow the dropdown to “Mount….”, click on it and navigate to the downloaded Windows 10 iso file and select it, it will automatically mount. 5. Go back to “Computer” on the Windows Explorer and double click on the "Virtual Disk Drive" which has now been loaded with the Windows 10 Setup. 6. Open the drive and locate the “Setup.exe” and click to run the upgrade/Installation. 9. After completion, you can then look around to familiarize yourself with the interface and check your settings and privacy. 10. Then finally, you will have to activate your copy of Windows 10. This version of Windows is really a mastercraft between the best of Windows 8.1 and the ruggedness of Windows 7 and you can easily switch to tablet mode with just a click. If you ever get confused, Cortana is there for you. How do u activate it after install and will you lose ur files and app from the previous window? I have installed it. But it seems my vga is not compatible with it and my kaspersky anti-virus cant install. Any solution to this? Yes common issue after installation is display. Just go to the Device Manager, look for Display and update the driver. Make sure that you are connected to the Internet. Update any other devices showing yellow sign on the device manager. What of the antivirus issues, I have tried different types still not comparable. I would like to know where the installation stopped. In the meantime, try this ; right-click on the set up exe and select "run as admin"
Am downloading windows 10 with Etisalat 50 naira pack. . Unlimited.. It's free it's still pay me..
Etisalat really throttled this social pack..
Can't reach 100kps minimum 30.. Thanks, i later use mtn bis..
And it's asking for product key.. Please what's the product key? Thank you very much it works.. Thanks, would try it this evening..
Unzip and follow the instructions on the read me file to activate. Make sure you right click and run "As Administrator". If you can buy the Windows, it is worth every penny.